Fish and chips, one rarely comes without the other but we do not talk a lot about “the chip” very much. Chips are the understated champion of a great portion of fish and chips. Much thought and preparation goes into serving our customers a delicious, crunchy on the outside, yet fluffy on the inside chip experience- so how do we deliver the perfect chip? First, we select certain varieties of potatoes and from certain farms only. Our potatoes must without fail have the following attributes to even be considered good enough for our Harbourside customers…. Did you know we even have an optimum size we try to achieve for each chip which is 17mm x 14mm? This is the best size for the healthiest chip. Beyond this size the chips take too long to cook and smaller chips have a more surface area and so absorb more oil making them more unhealthy. So you see we really do our best to consider everything to make sure we are delivering the best chip possible you to enjoy…. 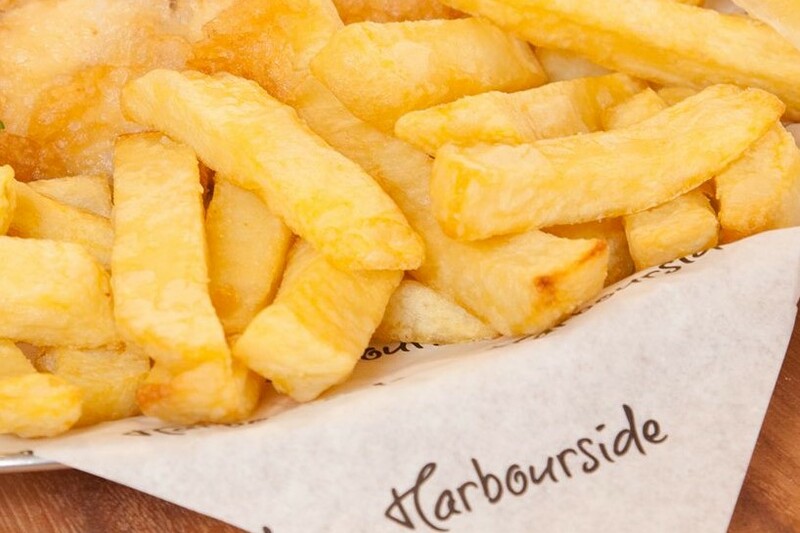 Harbourside chips are fried to a light golden colour to a perfect time to ensure a crispy bite with a fluffy inner. All you need do is decide what will you be dipping your chip in…. ketchup, gravy or curry sauce? All hail the mighty chip! See you soon to serve you your next portion!